The government may levy a windfall tax on oil producers like Oil and Natural Gas Corporation Ltd. as part of a permanent solution it is working on for moderating the spiralling retail prices of petrol and diesel.The tax, which may come in the form of a cess, will kick in the moment oil prices cross $70 per barrel, sources privy to the development said. Under the scheme, oil producers like ONGC, who get paid international rates for the fuel they produce from domestic fields, would have to part with any revenue they earn from prices crossing the $70-threshold. 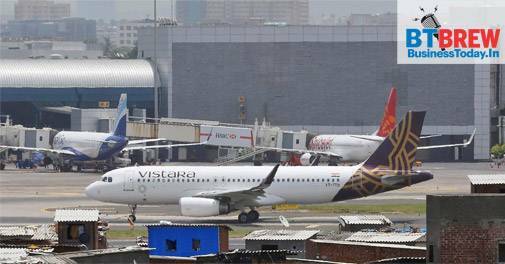 Vistara -- the airline joint venture between Tata Sons and Singapore Airlines -- faces more engine trouble than what the company would like to admit.The airline has been reporting multiple problems in its CFM Leap I engines, four of which have already been replaced after induction only a year ago. Another two are awaiting replacement following problems in their turbines. A couple of days ago, a Delhi-Bengaluru flight could not take off because the engine wouldn't start. Apologising to passengers on Twitter, Vistara admitted: "Though it is a very new aircraft, there is a technical glitch that has caused the delay." The Central Bureau of Investigation is conducting a discreet enquiry against eight senior-most income-tax officials, including Central Board of Direct Taxes (CBDT) chairperson Sushil Chandra, under the direction of the Prime Minister's Office, sources in the Ministry of Finance have told India Today TV. Sources added that this was the reason why Chandra's extension has been put on hold for the past two months as his file is with the PMO. He was supposed to retire by the end of May. A vigilance clearance is being done against all CBDT members before selecting the final name on the direction of the PMO, sources said. It is believed that these I-T officials misreported and undervalued cash transactions that had taken place at showrooms owned by Nirav Modi's companies. The European Union's new data protection laws came into effect today. The EU's so-called General Data Protection Regulation (GDPR) has been blamed for a flood of spam emails and messages in recent weeks as firms rush to request the explicit consent of users to contact them. Brussels insists that the laws will become a global benchmark for the protection of people's online information, particularly in the wake of the Facebook data harvesting scandal. The law establishes the key principle that individuals must explicitly grant permission for their data to be used. The new EU law also establishes consumers' "right to know" who is processing their information and what it will be used for. People will be able to block the processing of their data for commercial reasons and even have data deleted under the "right to be forgotten". The news on the banking sector's bad loan problem keeps getting worse. Earlier this week, reports pointed out that India's private banks have recorded a 450 per cent jump in gross NPAs in the past five years. But according to a recent CARE Ratings report, there has been a significant spurt in NPAs even on a quarterly basis where the fourth quarter results of the last fiscal are concerned. So far, 26 banks, including the country's biggest lender the State Bank of India, have announced their Q4FY18 financial results. "After moderating from 9.04 per cent in June 2017 to 8.93 per cent in September 2017, the [Gross NPA] ratio has ascended subsequently to peak at 10.14 per cent in March 2018," said the report.